To upgrade the appearance of a tired-looking glass-topped table, you can paint the top or let a painted surface show from underneath. To paint the underside of a tabletop, you can use special glass paints, but those are typically available in a smaller color palette. Painting the top allows you to cover up any unsightly scratches and abrasions, and if you use ordinary house paints, you can choose from thousands of colors. Either choice provides the opportunity to change the table's appearance to better fit your home's decorating scheme. If you paint the top surface of your glass tabletop, you can match the color to your other furnishings. Spread two sawhorses into place to support the tabletop in your painting area. Cover the tops of the sawhorses with a soft cloth to minimize the risk of scratching the glass. Lift the glass tabletop off the table and gently place it, upside-down, on the sawhorses. Recruit the aid of a helper if the tabletop is especially large and heavy. Wipe the surface of the glass using a clean rag soaked with rubbing alcohol to remove any grease or other surface marks. Follow up by cleaning the tabletop with either white vinegar or an over-the-counter glass cleaning solution. Allow the surface to dry to a sparkling clean shine. Apply the glass paint as directed by the paint's manufacturer. Spray paints should be applied 8 inches from the surface; move the can back and forth at a rate of about 1 foot per second. For non-aerosol paints, a foam applicator is usually recommended. 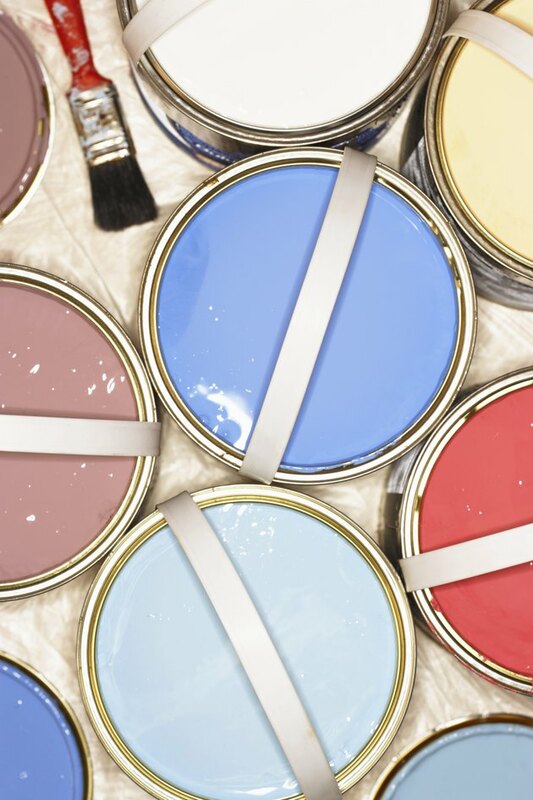 Apply a thin coat of either paint type; then add a second coat if necessary for good coverage. Allow the paint to dry thoroughly overnight. Then lift the glass tabletop from the sawhorses and flip it over before placing it back on its frame. Spread dropcloths around the floor under the table, and apply painter's tape to any perimeter framework of the glass tabletop. Clean the tabletop using white vinegar or a glass cleaning product, applied with a clean rag or paper towel. Rinse with water, and squeegee or wipe the table dry. Apply a bonding paint primer, also known as an adhesion primer, to the tabletop using a pro-grade paintbrush. Let the primer dry for two hours or as directed on the product's label. Brush on a flat acrylic-latex paint using a pro-grade paintbrush, which will minimize the appearance of brush strokes. Allow the paint two hours to dry, or as recommended by the manufacturer. Apply a second coat if necessary for complete color coverage. Use the pro-grade brush to apply a thin coat of water-based clear polyurethane varnish over the painted surface. The polyurethane provides increased hardness, water-resistance and gloss. Allow the polyurethane three hours to dry or as directed by the varnish manufacturer. Follow up by adding a second coat; then let the final coat of polyurethane dry overnight. Remove the painter's tape and dropcloths, but wait another day or two before placing objects on the tabletop.